My suggestion on feeding the fish is the same as always and this is that when the weather gets warmer and you go outside on a nice day, without a coat on and you feel warm then you can feed the fish. But only enough that they can eat within say 10 minutes, any food left on the surface needs to be removed and reduce the next feed by that amount. If you go outside and you feel cold or its not a nice day then do not feed. The fish will not starve! You can feed several times a day in the summer, but remember if the weather is too hot the fish may not need any. The best time of day to feed the fish is either lunch time or early evening, not so much in the early morning as the fish may not be as active at this time of day. 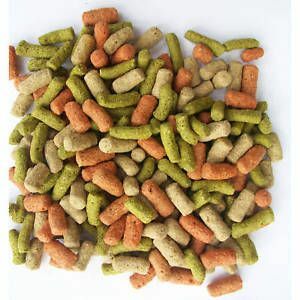 As for types of food this varies on the fish in the pool along with your own preference, I prefer to feed my own fish a variety of pellet and stick food and sometimes, fresh food, Most fish will eat just about anything from chopped up worms to beef burgers. Yes my fish eat these as when we have a barbecue any left over food such as rolls, sausages, beef burgers etc are cooked and then broken up and fed to the fish (they can’t wait till I have a barbecue). I will list below certain foods you can feed but as with any pet you need to be careful in what you feed and how it is prepared. Bread, brown bread is best, preferably toasted to remove moisture and kill off any yeast. Then break up into manageable size and feed as normal. Biscuits, again wholemeal type i.e. digestive, break up or throw in whole, depending on the size of fish. Lettuce, cabbage etc. finely shredded and thrown in the pool at feeding time. Cooked meats, tuna, dog or cat foods either tinned or in biscuit form, again break up to suit the size of the fish. Blanket weed. Yes contrary to what you think fish do eat Blanket weed, it is nature’s finest and freshest food they can eat and in most cases in plentiful supply. Daphnia, blood worms, fresh water shrimps etc. frozen ones are the best to feed unless you cultivate your own. To cultivate your own Daphnia (water fleas), you need a bin or large container, some clean straw, pool or rain water, some live Daphnia, which can be available from good aquatic centres. Fill the container with the water and put in the straw, you may need to weight it down to start off with till it becomes water logged. Introduce the live Daphnia into the container then place in a warm light area and wait. This can take several weeks but eventually you will have your own supply, all you need to do is fill a jug with some of the water and it will contain loads of fresh Daphnia for you to put into your pool. Remember to top up the container every so often. You can increase the colony by the use of an air pump and air stone if you have access to one and can keep it in a dry weather proof area. I could go on forever but it gives you an idea what fish will eat, I am always being told about other food sources that particular customers fish eat, in the same respect some peoples fish will only eat certain foods and nothing else. My advice is give it a try, but use common sense and if your fish do not like a particular type of food then remove the uneaten food and try something else. Only feed the above types of food occasionally, as a treat, not all the time, the fish should be fed a staple diet with the occasional treat.